I specialize in walking you through the (often) emotional process of purging items that are storing negative energy in your closet and in your life, and transforming your space for comfort and productivity. Everything has a place. Sometimes that place is Goodwill. Let me help organize your belongings and ease you through the transition of evolving your surroundings as you evolve into the person you always wanted to be. Whether you're moving, downsizing, expecting a bundle of joy, have toddlers, just made that big break or you are just busy and need to get organized, I will revolutionize your living space into an ergonomic and contemporary habitat that is tailored to your needs, wants, and concepts of home and/or work. Christel Ferguson was born and raised on Long Island. After moving to Manhattan, she lived in multiple close-quartered spaces throughout NYC giving her the opportunity to engineer creative storage and organizational solutions. The small, city apartments introduced her to the necessity of letting go of items she didn’t truly need. Multiple moves, including her relocation to Los Angeles, allowed Christel to devise and implement efficient packing/unpacking and moving plans. The permission she was given, combined with the liberating feeling of “letting go” of unnecessary things, and the pride born from creative ingenuity, inspired Christel to channel her energies into the talent and skill she had been honing for years. She created Space to Love to help people like you lead happier, healthier lives. Change your space… Change your life! As a wedding planner, Christel offered the personal touch in getting to know the couple, and working with them to exemplify their style, to create menu choices, floor plans, color palette and decor that addressed the couple’s needs and allowed their personality to shine through for their special and memorable event. As Head Sales Associate at an interior design retail store, Christel revelled in merchandising the cache; creating new displays that highlighted various items, which led to increased sales. The effort was “just fun and easy.” Whether she was helping customers find the perfect enhancement for their home or asking clients the ‘right’ questions to yield the perfect gift, Christel loved helping people make their lives easier and more enjoyable through the medium of design. As a friend and family member, Christel has been the go-to person for closet-overhaul and garage reorganization. Always eager to help a friend, she would immediately ask, “Great, when do you want to get started?” The day came when Christel realized that not only did she find this type of work pleasurable, but it was truly her calling. Not realizing that organizing was an actual profession she started to look on-line to see if anyone else did this sort of work. 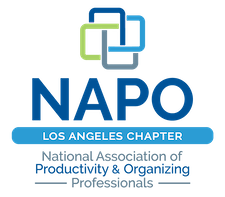 The first site she clicked on was NAPO (National Association of Professional Organizers) where she has been a member now since 2013.